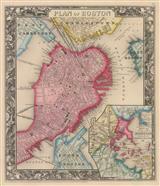 Description: Elegant and early map of Boston with a panel referencing the fortifications. Later hand colour. Description: Scarce chart centring on Boston Bay published on the eve of the Revolutionary War. A large inset on the upper left shows a plan of Boston. 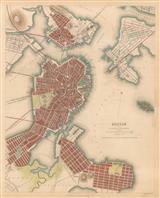 Description: Chart of Boston, its defences and environs taken during the Revolutionary War. Coloured. 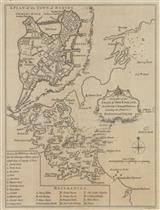 Description: Early map of Nantucket detailed from the diary of an French planter. Description: Rare map of the State with original outline hand colouring. Description: Map of Massachusetts, Connecticut, Rhode Island, and Long Island, with inset city plan of Boston. Coloured. Description: Boston. Attractive city plan. Coloured. Description: State map of Massachusetts and Rhode Island, with an inset of Boston. Original colour. Description: Attractive state map containing an inset of Boston with decorative borders and original colour. Description: Attractive plan of Boston with vignettes of State House, Bunkers Hill Monument, and a panorama of the Harbour. Coloured. Description: Boston. Charming miniature town plan with later outline colour. Description: Striking map of Boston, with inset map of Massachusetts and Boston Harbour and surrounded by elaborate border. Original colour. Description: The city of Boston, its environs, and the archipelago of islands that make up the harbour. Original colour. Cartographer: A Williams & Co.